This was a great weekend for disc golf and it felt great to hit the course and toss some discs. It’s been a while since I’ve been able to hit the course (I know I keep whining about it, but that’s the point of this blog, duh), but there wasn’t any rust on these throws and I think I actually saw some improvement this past Saturday. Also, it was great checking out a new course, Lake Township Park over by Warren Dunes on Lake Michigan. 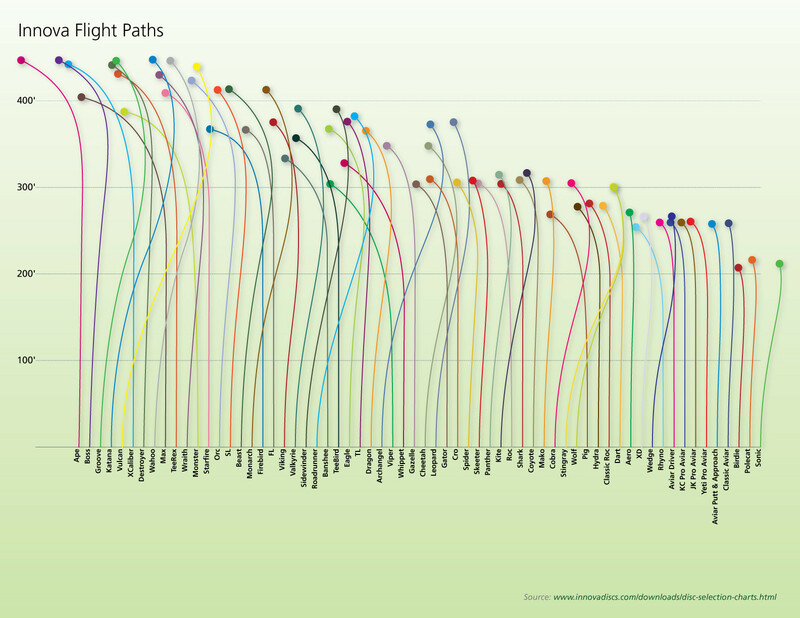 A nice course that I think you should check out if you are over that way. Let’s talk about the course first, because it has an interesting hole and one hole that I guess is a premier hole. Both of these holes are worth talking about in detail. First, to start off, the course is in a nice sports park and was originally nine holes, but recently moved up to a normal 18 hole course. Being part of a sports park, I think there is somebody there to take care of the course or nobody knows this course exists. I didn’t see any garbage around any of the holes (a major pet peeve of mine that I’ll talk about soon), which was surprising because I didn’t see very many garbage cans around. They had maps at hole one, which I liked because some of the pad placement was a little funky. The majority of the holes were short, around the 200 foot mark, making you feel like a superstar with every drive. Not saying that it was an easy course. The first nine holes were in not quite a forest (you’ll here about that in a second) but some sort of hilly tree area. So, they placed a lot of the baskets right on the other side of a tree, making you almost have to come around the back-end of the basket. After that there were some open holes, those were the ones that had some length, hitting 400 feet. And a couple of the holes were on the edge of the park, testing your fence climbing skills if you had a stray throw or the wind was deciding to be evil and wanted to grab your disc. Now, the two holes that I think need to be discussed at a bit of detail. Hole 3 and hole 11. Hole 3 for it’s apparent notoriety and hole 11 for it’s ridiculousness. Before going camping this weekend, I did a little research on if there were any disc golf courses around Warren Dunes, and Lake Township was the one. Well, in everything I read, they said hole 3 was the hole to look out for. 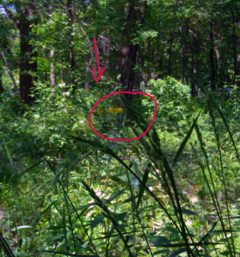 According to Disc Golf Course Review and the PDGA website this is the trademark hole. My question: why? It’s a straight shot from the pad to basket, 492 feet, with a fence on your right and some trees around the basket. Yes that fence could be a problem, but for most people who throw right handed and do a back hand throw, that disc is going to go left, away from the fence. And yes 492 feet is a long hole, but not the longest one I’ve seen (that was a course in Illinois, the hole was over 900 feet I think and the longest in the state). There is a little worry that your disc might go rogue and go deep in the woods that is on the other side of the fence, but it’s a very very tiny worry. I guess if you are playing tournament rules, you might have a little trouble with this hole because there is a parking lot and sidewalk that you have to throw over, and if you land on them that is usually considered out-of-bounds. But, there were five of us out there and I don’t think anyone landed on the out-of-bounds area. I hit par on that hole, and I would have gone one under if it wasn’t for a stray tree branch that was in my way. If the disc golf sites are going to consider hole 3 the trademark hole, I wonder what they would consider hole 11? The park is broken in half with a thick forest separating the soccer fields from the baseball diamond and pond. This forest is actually labeled as a “Boy Scout Trail” and does have a couple of trails going through it. However, hole 11 must of been created by someone that has never heard of the word “fairway” or “lawnmower.” Trying to find the pad was a beast, and then trying to find the basket was like going on an expedition in a newly discovered jungle forest. There was underbrush every where. Nothing was cleared out. And I don’t think anything had ever been cleared out. You were throwing blind from the pad, definitely needing a spotter to help keep track of your disc. I guess there were tiny bike paths along the sides of the woods, but nothing you could use to help you throw from a clear area. I highly recommend using the overhand throw for this hole. We had to hunt down the basket first, which again, didn’t have a “green,” then we had to station a couple of people in the woods to help spot, and after we threw, we took over for the spotters to throw. It was a big process to get to the basket. I can’t imagine trying to do that hole either by yourself or after a rain. It would be full of bugs and just plain nasty trying to go through it. I have a picture on my phone that I’ll post to show you the insanity of the hole. The picture speaks for its-self. This is at about the halfway point of the hole. As you can see, nothing was cleared. I went to the course with my father-in-law and my nephews. This course was perfect for my two youngest nephews because of the shortness of the holes. They had a great time on the course, challenging each other, figuring out the yardage equivalent of each hole, and trying out our different discs. 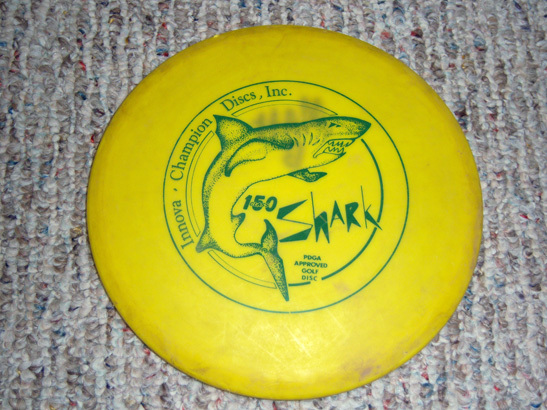 It is funny to watch them come up with reasons for wanting to use different discs, usually having something to do with the color or how one of us older guys did with a disc. Made me laugh and think about why I have so many discs. Do I really need the ten discs I have in my bag? 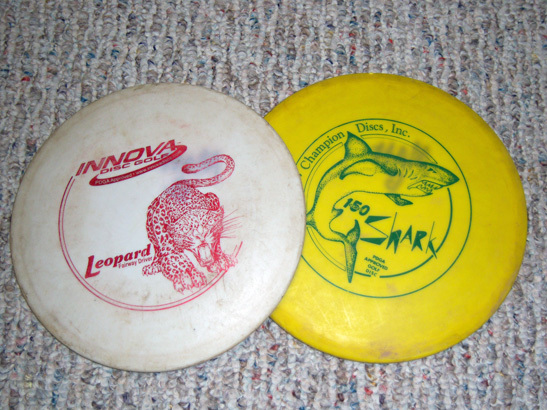 Why do I switch to a Roc or Shark or Leopard on the fairway? Is there really that big of a difference between my Pro Star and Pro Beast? Could I do just as well with one or two discs? I have gone into some detail on testing out my discs, so I guess I can say there is a difference between all of them. I really think it has to do more with the golfer than the disc. However, we gave them a new disc when they asked and it made them feel good and that’s all that really matters. One thing that should have shocked me, but didn’t, again having talked about it, was that they were really good at the forehand throw. It’s pretty sicking to see how easy it is for them to just whip a forehand throw like it’s nothing and have it go exactly where it should while my throw wobbles off into a bunch of trees way to close to count for any type of throw. I’m glad they can do the throw and that they can get out on the course, they keep it up and they will be major competition for some of the guys that are pros. As for me, like I said above, I did see some improvements on my game and I feel good about it. My drives are going a lot further, cutting down my mid range drives usually by one whole throw. On hole 17, which is a long hole, around 500 feet, I got within putting range in two throws. It did go a little further right than I wanted, having to do with me letting go at the wrong time, but it was still easy to recover from. My putting wasn’t too bad. I got a couple of putts I didn’t think I could get and some that I thought I would get, I bombed. I’m having a hard time hitting the chains on the right side of the basket, and I can tell it’s a problem because my putter keeps passing the basket on the left side. So that is something I need to work on with the practice basket. Another thing I noticed was that the type of basket can make a difference. 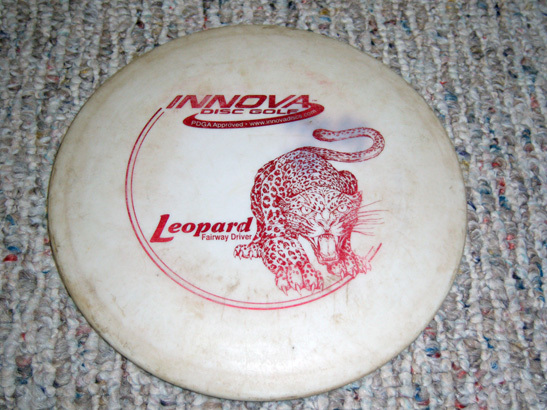 They have Innova baskets, which have this plastic ring around the top that your putter can use to bounce off of. I’m use to the metal pieces that a lot of other baskets have, which usually just stops the putter and drops it into the basket. The plastic ring however, gives your putter enough bounce to push it away from the basket and back to the ground. I did try doing more forehand throws, but those still gave me results I didn’t want. My overhand throw did come in handy for some of the holes(as mentioned above) and I do feel like it’s something that I want to pursue further. It was a great time and I do recommend you try out the course. For the five of us, including three children, it took just about two hours. I can imagine it taking a lot less time for people who disc on a regular basis. So, if you are driving to Chicago from Kalamazoo, or the other way around, stretch your legs and go to Lake Township park (it’s like two minutes from the highway, but doesn’t feel like it when you are actually at the park). It’s possibly going to be our starting point on our trip of Lake Michigan courses, being an ideal meeting point for my brother-in-law in Chicago. What course did you go to this weekend? Have you been to Lake Township park before? Disagree with my assessment of hole three? Let me know. I reached par on probably 60% of the holes, which isn’t too bad, but I don’t think it’s worthy of goal accomplished. My overhand throw did me well. I think if I keep it up it could do even better. I think I did beat my nephews, though the 15 year old was really close to my score. That’s what they get for being young, losing!!!! Forehand throw still needs a lot of work. It’s really wobbly and goes right way too early. I’m sure this just goes back to me letting go to early. Do not be afraid to try the forehand throw. I think my biggest problem is that I’m a bit too competitive and am scared to waste a throw that might not go anywhere. But this causes me to not practice a throw that needs to be practiced before it gets better. So, I need to just force myself to do one whole disc golf game forehand. Eighteen holes in a row of forehand throwing should be good practice.